Eating a healthy, balanced diet is an important part of maintaining good health, and can help you feel your best, especially when allied to regular exercise. This means eating a wide variety of foods in the right proportions, and consuming the right amount of food and drink to achieve and maintain a healthy body weight. There is lots of advice out there on what to eat and when to eat, much if which is confusing and sometimes contradictory. Here’s what we think is some of the best advice. 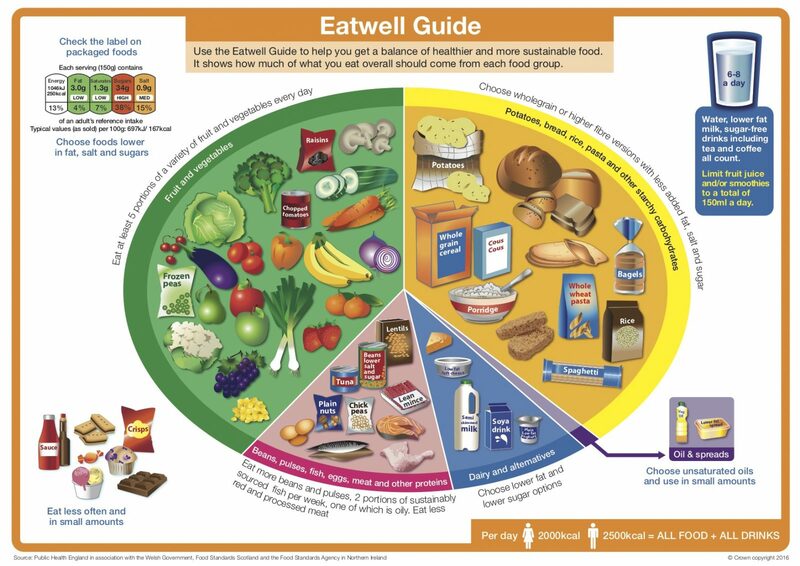 The NHS Eatwell page covers healthy eating advice for the general population. People with special dietary needs or a medical condition should ask their doctor or a registered dietitian for advice. Eat the right amount of calories for how active you are, so that you balance the energy you consume with the energy you use. If you eat or drink too much, you’ll put on weight. If you eat and drink too little, you’ll lose weight. Eat a wide range of foods to ensure that you’re getting a balanced diet and that your body is receiving all the nutrients it needs. It is recommended that men have around 2,500 calories a day (10,500 kilojoules). Women should have around 2,000 calories a day (8,400 kilojoules). Most adults are eating more calories than they need, and should eat fewer calories. The Change 4 Life recipes page, provides loads of great ideas that are cheap and very easy to do, to help you substitute unhealthy foods for healthy alternatives. There is also a useful App that is free to download, containing over 160 quick and healthy meal ideas. And help us make a difference. Why not help us support the Rugby League family by making a donation to Rugby League Cares? Donate £20 and we'll send you an electronic copy of our twice-yearly magazine, One In, All In and keep you up to date with all the important work we do. Rugby League Cares is a registered charity in England and Wales (1150763). Web design and development by Orange Crush Digital.